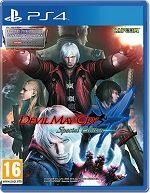 For the uninitiated, the original Devil May Cry series brought forward the idea of playing with SSStyle; with breakneck speeds, intricate and acrobatic combos, perfect controls, and an intense presentation filled with the Capcom-esque grit reflecting the trends of the time, Devil May Cry is a direct influence to many of today's similar titles. Seven years after the original launch, Capcom is bringing back Devil May Cry 4 - the publisher's first PS3 title with Devil May Cry 4: Special Edition. On the PS4 and Xbox ONE, with a treatment similar to their recent revival with Resident Evil: HD Remaster, DMC4: SE will have new game modes, gameplay and visual improvements, and perhaps the most exciting aspect for fans, the largest playable roster in any DMC game yet! Speaking of the roster, fan favorite Vergil is playable, with his appearance based on his rendition from Devil May Cry 3: Dante's Awakening Special Edition. Gameplay wise, a new mechanic is introduced known as "Concentration", which complements Vergil's iajutsu style rewarding players with progressively stronger attacks when fights are executed calmly without the dependency of button mashing. This combined with the "Grim Trick" teleport ability, will not only challenge veterans and newcomers alike, but offer a distinct experience separating Vergil from both DMC mains Dante and Nero. Two other exciting additions to the roster once again channel fan favorites, and each character has a distinct playstyle which adds to the replayability common to the Devil May Cry Series: Trish and Lady! While Trish is a returning playable character, her biggest change is the removable of her previous style of weapon switching, and now instead uses the Sparda sword in a multitude of ways without complex button combinations; although this may sound simple, it is far more difficult to excel with simplicity, and this new play style will be something to look forward to. For veterans, Devil May Cry 4: Special Edition will see the debut of Lady as a playable character, and her focus is on long-range fighting; this emphasis on firearms will also introduce an entirely alternate way of tackling the many foes seen in this frenetic title. Along with all the improvements and additions, extra features see the implementation of the "Legendary Dark Knight Mode," which was missing from the original PS3 version; players will be facing constant pressure as this mode places them against a monstrous amount of enemies - only those with adept skills or veterans looking for an even more extreme experience will find solace here. Finally, expect to see a veritable wardrobe of new costumes for each character, compatible with in-game cut scenes as usual with Capcom titles, just for that added visual freshness! Look forward to one of most exciting series of our time, with Devil May Cry 4: Special Edition - releasing this Summer! Asian Playstation Plus Account required for specific online-features. Legendary Dark Knight Mode: Fight a massive number of enemies simultaneously for extra difficulty and maximum satisfaction! Refined Gameplay: Small adjustments have been made to improve the gameplay tempo, and provide an even better experience for players both new and returning. Liebe Nero mit seinem Arm! Super coole Specialmoves und toll animiert. Man fühlt sich unbesiegbar.